Premium-quality Micrograin carbide tips are ground on specialized CNC equipment for an extra-fine finish with maximum sharpness and edge retention. 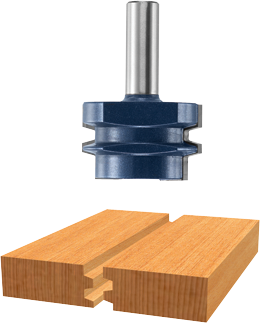 The reverse glue joint bit creates strong and self-aligning joints. When set up so the center of the bit profile aligns with the material center, cut one part face down and the mate face up for both halves of the joint. The fully hardened and tempered steel shank provides ultimate durability. B. Cutting Edge Length 1-3/32"